The Power to Translate is Now Inside Marketo! Lingotek's cloud-based translation and localization platform gives you the power to build consistent, up-to-date, multilingual automated marketing content. Marketo's marketing automation software helps marketers automatically engage customers and prospects and manage marketing campaigns. Getting your marketing emails to display correctly in Gmail, Outlook, Yahoo, Apple Mail, etc. can be a challenge. Using our connector means you can automatically rebuild emails in another language without having to reformat the entire page. Simply install the Lingotek + Marketo browser extension, and manage all of your translations inside of Marketo. To install the connector, simply download our browser extension. No complicated configurations required! Lingotek tools display inside Marketo. No need to learn a new system; intuitive translation icons display on each page. Request translations from any page. With color coded indicators, easily track translation status for each language. Search for items; don’t hunt and scroll. Eliminate tedious, repetitive work with bulk actions. Check formatting with our preview tool. Rebuild each page automatically. No reformatting required! Pay for translations once! Automatically reuse translations repeated across all documents. Simplify project management with automated translation workflows and assignments. Automatic alerts notify project managers when work is done. New content is tracked; retranslations can be requested automatically. With the ability to translate geographic-specific dynamic content, craft locale-specific messaging. Automatically track new content; send updates for retranslation. Keep translations organized into Lingotek projects. Choose resources (glossaries, workflows, and translation memories) for each project. Manually or automatically publish completed translations. Save training and licensing fees. The connector is embedded into Marketo. No additional license fees required! Translators complete translations outside of Marketo. Then, Lingotek rebuilds each translated file behind the scenes as soon as it is complete. Administrators can manage translation for many languages within a single app. Display content in the user’s native language. Keep translations private until they are ready to publish. Use your own translation agency or tap into Lingotek’s network of more than 5,000+ in-country translators. Which items can I translate? Lingotek - Inside Marketo can handle translations for emails, email templates, forms, landing page templates, snippets, and dynamic content. Landing pages will be supported in a future release. Do I need to purchase a CAT tool? No. The Lingotek module comes with a built in CAT tool--the Lingotek Workbench. I have several translators that I use often. Is there an easy way to automate their translation assignments? workflow. Simply apply the workflow whenever you have a Korean translation project. Can my new or existing Language Service Providers use Lingotek’s Translation Network? 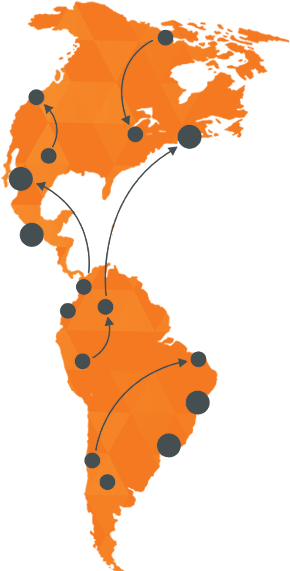 extensive experience in implementing new and existing LSPs with our Translation Network. Can I use existing linguistic assets--Translation Memory, glossaries, etc.--in Lingotek? maintain full control of those assets. I need to translate into several languages. How many languages can Lingotek handle? (or as few) languages as you like. Install the Lingotek + Marketo browser extension, and start requesting translations! Check out all of our Marketo Resources.